Taryn Cook might think she and her mother, Sarah, are playing a game of hopping across the stones of a stream but they are really doing therapy to strengthen the muscles of her legs that help her balance and walk. According to Sarah, through the services provided by the Delaware County Board of Developmental Disabilities, Taryn has made great progress to the point she is walking, running, singing and talking in multi-word sentences. All three county commissioners approved placing a new 0.4-mill continuous levy on the November ballot to support Delaware County Board of Developmental Disabilities’ (DCBDD) increasing enrollment and demand for services. According to data provided by DCBDD, if the levy is approved by Delaware County voters, it will generate $3.1 million per year and cost a taxpayer of a $100,000 home valuation $14 per year. Also, if approved, Hodge said DCBDD will allow the current 0.56-mill renewal levy to expire in 2020, which currently cost a taxpayer of a $100,000 home valuation $16.36 per year. The current 2.1-mill renewal levy, however, which cost a taxpayer $56.22 per year based on a $100,000 home valuation, will remain. Hodge said the average population of people with disabilities in any given area is 1 to 3 percent. “Delaware County is on the high side,” she said. Hodge added that 79 percent of those served by DCBDD are children, but all age groups are quickly increasing, especially the adults. According to the data, the average cost for a school-age child is $2,101 per year, while the average cost for an adult is $16,293 per year. Over the next five years, nearly 160 children will become adults, increasing the cost to almost $8.5 million. Hodge said that DCBDD had 87 referrals in a nine-month period. She said out of that number, 25 percent of the referrals relocated to Delaware County for the schools, 23 percent relocated to the county for work-related reasons, while 15 percent of the referrals were for the services provided by DCBDD. “I have no data to tell you if that is up or down from previous years, but I do believe that when you look at all the reasons that people move to Delaware (County), we are a part of the puzzle but not the chief reason,” she said. Hodge said that in 2017, only 14 percent of the DCBDD budget was administrative costs, while the remaining 86 percent was for the cost of services provided to the people DCBDD serves. Hodge said that DCBDD also leverages Medicaid money to provide more services in the community. Hodge added there are not a lot of counties in Ohio that can say they have more services than what is in the budget. According to Hodge, the revenue DCBDD receives from levies comprises 74 percent of their budget with other revenue coming from intergovernmental sources, grants and reimbursements, and miscellaneous avenues. “The majority is through our tax dollars here in Delaware County,” she said. “It really helped me to understand where things are going,” he said. Benton said it made sense to have a continuous levy versus having two levies that renew at the same time. “I intend to vote for this going forward,” he said. Hodge said there was a lot of forecasting that went into the 0.4-mill continuous levy. 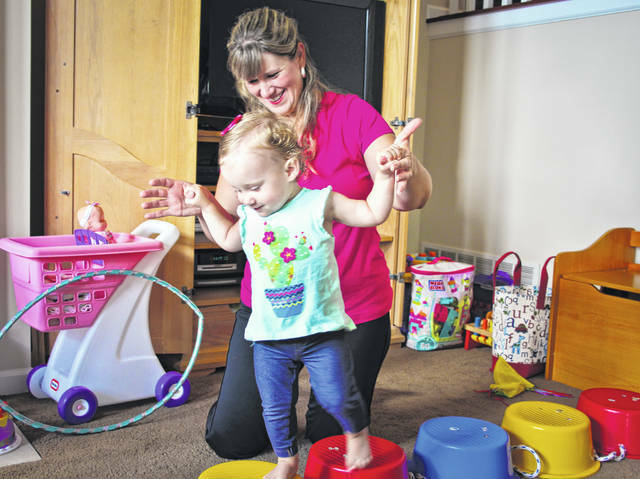 https://www.delgazette.com/wp-content/uploads/sites/40/2018/08/web1_IMG_1713-copy_1.jpgTaryn Cook might think she and her mother, Sarah, are playing a game of hopping across the stones of a stream but they are really doing therapy to strengthen the muscles of her legs that help her balance and walk. According to Sarah, through the services provided by the Delaware County Board of Developmental Disabilities, Taryn has made great progress to the point she is walking, running, singing and talking in multi-word sentences. This entry was tagged .04 mil levy, D. Anthony Botkin, Delaware County Board of Developmental Disabilities, Delaware County Commissioners, Kristine Hodge. Bookmark the permalink.